Okay, you have my attention. The truth is that I tried for years to learn to make omelettes and they were always, without fail, consistently awful. Rubbery and browned and thick and generally unappetizing. I don’t remember how who “taught” me to make them, but it involved flipping them like a pancake and the results were horrid. One look at this video of Julia Child making omelettes and I’m converted. Did you know these could be so easy? I certainly did not! But it turns out they are. And in the time it takes The Kiddo to say “I don’t wike it” I’ve got my new standard breakfast almost ready to go. It’s insanely easy to throw in some chopped up whatever-was-for-supper-last-night and a little cheese and I’ve got a meal. This one has chopped colby jack cheese and some leftover turkey from Martin’s, one of middle Tennessee’s greatest treasures: a BBQ joint which you really, really must try at some point in your life. Anyway, the protein in this omelette keeps me going all morning, and the fresh eggs are amazingly nutritious, tasty and pretty. By the way, as long as you’ve made the trip down to Martin’s, you can’t leave without stopping at the Nolensville Feed Mill too. Julia child said she was very careful about where she buys eggs, and so am I — the Feed Mill is the only place I’ll buy eggs. Don’t you love their gorgeous yellow color? Your turn! What would you put in an omelette? Yum. I can never make a successful omelette either. I’ll have to try this method next time! i’ve never made an omelette like this before, i always make the ‘puffy’ kind, put this looks like waaay easier. totally trying it. That’s what I’d always tried too! Epic fail, every time. These rock. 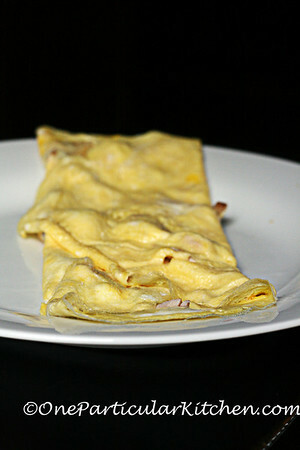 I’ve also never made omelettes like this (French omelettes I think?). These are so much more dignified! I think I’ll give it a try with some gruyere and herbs.